Large empty files are often used for testing purposes during disk access tests, development, QA, zeroing out data, and scripting. Though it’s certainly not applicable to most users, it’s easy enough to do that anyone can try it out even if you don’t have a specific need. We’ll cover three ways to quickly generate files of virtually any size, two will use the command line; one being operating system agnostic and the other MacOS and Mac OS X specific, and another more user friendly approach that utilizes the Disk Utility app native to Mac OS X. This is obviously aimed at a bit more advanced users with some fluency in the command line. To follow along, open the Terminal app to get started. The file is created instantly and takes up the full size. 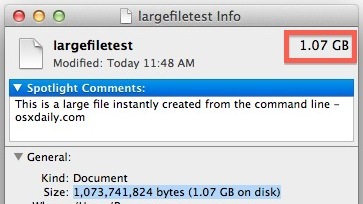 Big files created from mkfile are full of zeroes. The only downside to the mkfile command is that it appears limited to Mac OS X, thus if you’re looking for a cross-platform compatible solution that will work across other unix and linux variations you will want to use “dd” instead. The latter multiplication method from CyberCit can be a bit easier if you’re not great at estimating large byte sizes. 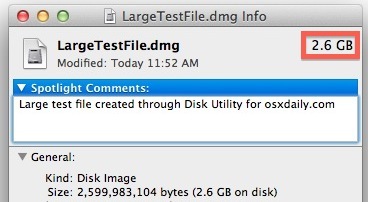 Though most users looking to create large empty files are probably going to prefer the command line, you can also use Disk Utility. Unlike dd or mkfile, the disk image will actually be writable by default unless otherwise chosen, which may or may not be useful for this development purposes. Whichever method you use, you’ll probably want to delete the large test file(s) afterwards, or else your hard disk can quickly be eaten up by the otherwise useless test files of enormous size. If you created the test files in an obscure folder and you can no longer locate them on your own, don’t forget that you can perform file size specific searches with Spotlight in the OS X Finder to quickly track down any large item in the file system. This is brilliant! Thank you! Being able to create a 3GB file in less than a minute is so incredibly helpful for testing minimal disk space. I was surprised when I created a 10gb file on a 8gb partition.